Everyone agrees that education is a good thing. Unfortunately, the agreement pretty much ends there. Although almost everyone agrees that education is good, there is wide disagreement on what education is. Since the beginning of the twentieth century, there has been a sometimes heated debate, not only about what schools should do, but what they should be. Generally speaking, there are two sides in this debate. On one side are the traditionalists, made up mostly of parents, but including older teachers and private school teachers. Traditionalism still holds sway in many private Christian schools. Classical education is a species of traditonalism that retains the older emphasis on classic literature and languages. On the other side are the progressives, made up mostly of educational professionals. Progressives dominate teachers colleges and educational publishing companies and control almost all of the professional academic journals and education publications that professional educators read. Almost all professional development programs for teachers in public schools are conducted from a progressivist perspective. The first and most important difference between the two philosophies has to do with how they conceive of education and what they think it is for. Everyone agrees that education is good, but there is a wide disagreement on what education is. For traditionalists, schools are academic institutions with a more purely academic purpose, which is to develop the mental ability of students in particular, and more generally to pass on the Western cultural heritage to the next generation. Classical schools maintain the emphasis on the full range of the Western culture and tradition, but even many non-classical private Christian schools, although they may not be fully aware of their debt to Greece and Rome, still emphasize those aspects of traditional American education that are grounded in Western ideas and values. Progressives, on the other hand, see schools more as social service agencies whose purpose is to prepare them for the social, political, and economic realities of modern life. This would include job skills training, certain forms of social indoctrination, and a certain amount of psychological conditioning. Traditionalism isn’t necessarily against all of these things, but it recognizes that they are approached best indirectly and only as by-products acquired while pursuing academic ends. While job skills training for progressives would involve instruction in specific skills needed for specific kinds of work, the traditionalist considers instruction in basic skills—in addition to higher kinds of thinking skills acquired through the study of grammar, logic, rhetoric—and math skills to be the best preparation for any job. The familiarity with history and classic literature, because of the ideals and values gained through the reading of it, would be considered to contribute to the formation of a more employable person. Social and political indoctrination for progressives commonly manifests itself in an emphasis on issues like environmentalism and multiculturalism. Recent national science standards, for example, place a great deal of stress on climate change. Traditionalists tend to avoid stressing particular political or social beliefs, and instead place an emphasis on a more broad kind of civics education that emphasizes an understanding and appreciation of America’s unique political order through a more academic familiarity with the story of America’s founding, and the more objective treatment of the nation’s history and culture through time. And while the progressivists consider an understanding of child psychology as essential for a teacher, and the practice of certain therapeutic exercises in the classroom as part of a teacher’s role, traditionalists tend to stress the kind of moral literacy that can be gleaned from the humanities, as well as training the affections through the reading of the Bible and, for the classical educator, classical history and literature. The second difference between these two philosophies has to do with what, in fact, schools should teach. Traditionalists believe in an academic curriculum that teaches mastery of basic skills in the primary grades and the more sophisticated language and math skills of the liberal arts in the higher grades. They also teach the basic facts of Western cultural history and thought. Perhaps more importantly, it seeks to inculcate the ideals and values that have formed the basis of the moral order that has undergirded American civilization and the European and classical civilizations on which it was founded. Increasingly, modern progressivists reject the idea that there is any one culture or academic curriculum that should be taught to all children. Education, they say, should be “child-centered, not subject-centered.” Western culture in particular has fallen in popularity among many of those who run today’s schools. Sometimes other cultures are held up as worthy of study. It is not uncommon to hear the objection that, for example, the classical education movement has a single-minded emphasis on Western culture, and that students should be familiarized with Eastern culture as well. But although this is a valuable objective, and one which is, in fact, pursued in most classical programs, those educators who champion nontraditional educational approaches seldom actually accomplish the multi-culturalism they champion. They more often end up teaching the dogmas of the modern Western monoculture that dominate among elites in developed countries that has little resemblance with the beliefs and values of Eastern or other native cultures. In any case, our education system has an obligation to master our own culture before studying other ones. In practical reality, the utilitarian, career-oriented emphasis of progressivism simply results in a fractured and highly unstructured course of studies that would be difficult to call a curriculum at all. If a parent were to ask those running the typical modern public school what his child could be expected to learn in a particular grade, he would find it difficult to get a coherent answer. This is because most schools really don’t have a cohesive curriculum, and whatever curriculum one school may have will in all likelihood be quite different from that of another school in another district, or even another school in the same part of town. This situation is exacerbated by the fact that, unlike most European countries, the United States has no national curriculum. And periodic attempts to impose such a common curriculum almost inevitably fail because of a cultural disconnect between the educational establishment and the general populace. Numerous attempts at trying to establish national history or English standards always end up being destroyed in the flames of partisan controversy. The consequence is that there is no actual curricular sequence a student is expected to progress through. This problem is less pronounced in math and science, in which there is still an acknowledged scope and sequence, but in the language arts and the humanities, the lack of curricular structure is particularly pronounced. In the more traditional American schools of the nineteenth century, students knew where they were in the implicit curriculum that was presented to them in their school readers. In the days of the McGuffey readers and other similar texts, if a student was asked how far along they were, they answered that they were in “the middle of the third reader,” or “just beginning the fourth reader.” All these readers followed a similar scope and sequence and there were common cultural touchstones they all sought to reference. And even in those rural schools that had little money for books, the teacher generally had the outlines of the common curriculum of her time in her head. She knew the system of arithmetic and taught it the way she had learned it. She knew the system of letter-sound correspondences and basic phonetic rules and stepped her students through the English phonetic system. She also knew the more simple common cultural reference points that were manifested in the stories of famous characters of history and literature. Although today’s traditional education is not quite as simple and straightforward as that which characterized earlier education in this country, there is still a significant commonality in the programs used; for example in most Christian schools, where traditionalism still thrives. In addition to a certain curriculum, which is a matter of what students should be taught, traditional educators have always believed in a certain method of teaching, which is a matter of how they should be taught. 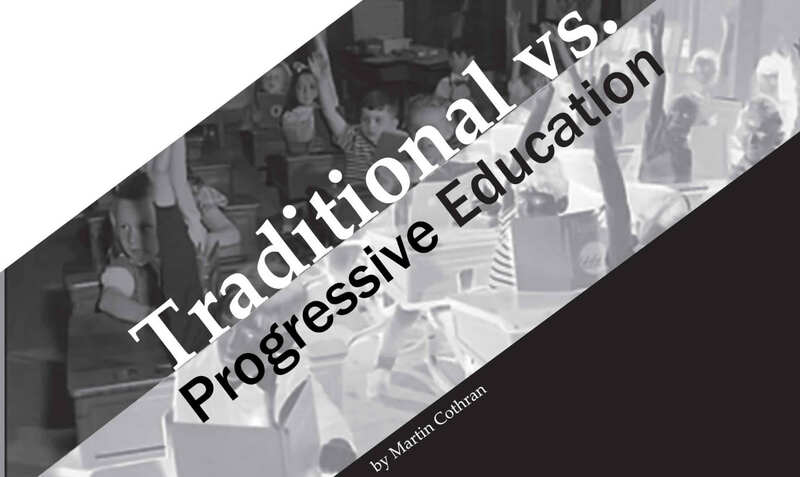 Generally speaking, progressives reject the academic, subject-centered educational view of the traditionalists in favor of a more romanticist “child-centered” approach taught in a non-directive way. They spurn any educational approach that puts students in a passive learning role and believe that all learning should actively engage the student through interesting and entertaining activities that are, insofar as it is possible, chosen by the students themselves. In the primary grades, this results in a de-emphasis on basic skills training, which is reflected in rhetoric that makes reference to “boring” drill and practice and “rote” memorization. Progressives believe that there should be less emphasis on a mastery of basic facts and procedures and more focus on the conceptual aspects of reading and mathematics. In addition, the teacher conducts the instruction in a much more non-directive way and classrooms are organized to reflect progressivist pedagogy, such as large tables, at which students often face each other, as opposed to individual desks facing the teacher, and “learning centers,” where students engage in more self-directed, as opposed to teacher-directed, activities. Traditional educators, on the other hand, have always recognized the central role of the teacher in guiding the learning of students. In primary grades, in which the priority is the transmission of the basic skills and content of reading, writing, and arithmetic, the teacher has an explicitly directive role in making sure that students master the material. Traditionalists believe memorization, drill, and continual practice are necessary to acquire knowledge and mastery of these skills, and that they require an instructor to administer effectively and efficiently. In addition to a highly teacher-directed classroom pedagogy for the basic skills and content needed in lower grades, traditionalists also recognize the essential role of coaching in advanced skills training and Socratic discourse in the inculcation of ideals and values in the middle and upper grades, but that, even here, teacher directedness never entirely goes away. The debate over these issues has been going on since progressivism began to displace traditionalism in American schools in the early twentieth century. The problem today is that most people are not familiar with the history of this rivalry, and more importantly, how these two philosophies of education really differ from one another. Modern classical educators in particular should strive to see their place in this history if for no other reason than to be able to avoid the pitfalls of those who are constantly confusing traditionalism and progressivism.